Looking for jobs in New Jersey? Local jobboard network AllCountyJobs.com LLC has just released its latest site targeted to NJ job seekers: NewJerseyJobShop.com. The sites design is a bit of a departure from the company's other sites. It has a light airy feel with a very clean/white interface. "We're proud to announce the latest addition to our job board family" says their CEO. The company now powers local job boards along the east coast from DC to Vermont. New Jesery's unemployment rate is currently at 9.2% Hopefully with this new resource that will go down a little. 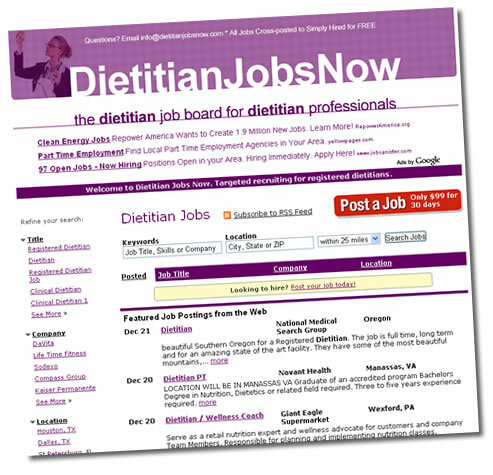 There arent many job sites dedicated to dietitian jobs. Now a site called Dietitian Jobs Now has launched to help. * Most jobs are in hospitals, nursing care facilities, outpatient care centers, and offices of physicians or other health practitioners. * Dietitians and nutritionists need at least a bachelor's degree; licensure, certification, or registration requirements vary by State. * Applicants with specialized training, an advanced degree, or certifications beyond the particular State's minimum requirement should enjoy the best job opportunities. AllCountyJobs.com, a Connecticut based job board company has released an updated list of job boards. Their network has expanded along the east coast in northern and southern areas such as the mid atlantic region and northern New England. The average salary for jobs in New York, NY is $46,000. Average salaries can vary greatly due to company, location, industry, experience and benefits. Since April 2009 New York City jobs increased 42%. Thats good news for NYC job seekers. Click here for more NYC jobs. Here's the proof below. CNC jobs, aka Computer numeric control machinists jobs are on the rise. The basic skills required are at least 1 year of machine shop training, plus reading and math, communication, problem solving, and the effective use of logic and reasoning skills. Physical skills: must have good vision, solid good eye and hand coordination. Basic computer skills. The average salary for CNC machinists is around 35k per year. Not bad for what many thought were a dying industry just a few years ago. The job market in Nashua and Southern New Hampshire is gaining steam. As the economy rebounds the unemployement rate in the greater Nashua region has gone down to 5.4%. 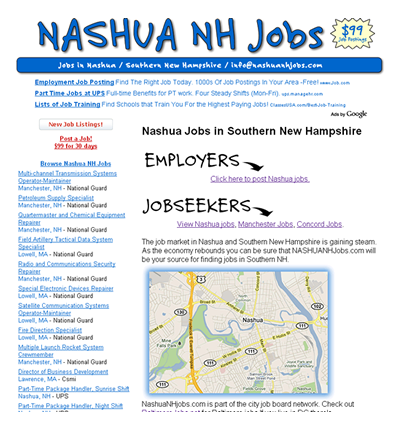 Now a new nashua job board has launched to offer employers a simple, easy to use recruitment tool. Its called Nashua NH Jobs.